49" x 23" x 17"
An emerging artist during the peak years of abstract expressionism, Richard Stankiewicz brought a sense of humor and lightness to the large, heavy sculptures he constructed from found scraps of metal. Born in Philadelphia in 1922, Stankiewicz lost his father in a railroad accident at the age of two. His mother moved her three children to Detroit, where Stankiewicz grew up in a predominantly German and Polish immigrant community. He attended Cass Technical High School, studying mechanical drafting, volumetric geometry, engineering, art, and music. Despite a scholarship for the Cranbrook Academy of Art, Stankiewicz could not afford college, and in 1941, he joined the US Navy. Discharged in 1947, he eventually made his way to New York City and then to Europe where in 1950, he was able to use funding from the GI Bill to study painting at Atelier Fernand Léger and sculpture with Ossip Zadkine. In 1952, Stankiewicz became a member of Hansa Gallery, a cooperative gallery founded by former students of Hans Hofmann, including Jan Müller, Jean Follet, and Wolf Kahn. Throughout the 1950s, he supported himself as a freelance draftsman while experimenting with various materials for sculpture. He created a series of insects sculpted from wire that were shown at Hansa in 1953, and that same year, he exhibited his welded steel sculptures which were hailed by Fairfield Porter as evidence that “life is stronger than the machine.”† A strong supporter of Stankiewicz’s work, Porter also wrote an article, “Stankiewicz Makes a Sculpture,” for the September 1955 issue of ARTNews. For the remainder of the decade, Stankiewicz’s work was increasingly well received, and he participated in numerous group and solo shows, including Young America 1957 at the Whitney Museum of American Art, Irons in the Fire at the Contemporary Arts Museum in Houston (1957), the Venice Biennale (1958), and a one-man exhibition at the Stable Gallery in 1959. A “masterful composer and animator,” Stankiewicz coaxed living forms out of rusted, abandoned, industrial detritus. 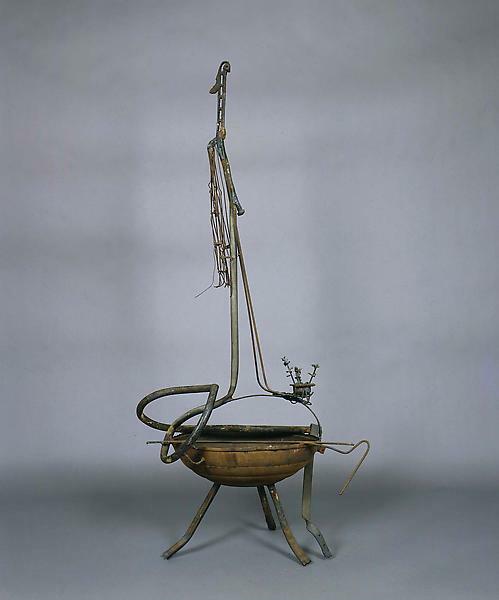 His sense of whimsy, controlled spontaneity, and the uncanny element of the inanimate becoming animate tie his sculpture to surrealism, but as Emmie Donadio adds, Stankiewicz’s work emerges out of early twentieth century modernism and prefigures what would follow in the second half of the century.‡ This placement on the threshold of early and late twentieth century modernism served Stankiewicz well, as he continued to exhibit and develop his sculpture throughout the 1960s and 1970s, establishing relationships with New York galleries even after he left the city in 1962 for rural Massachusetts. 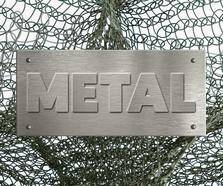 Although scrap metal had served Stankiewicz well, he continued to grow as an artist, discovering new materials to work with. In 1969, he traveled to Australia, where he produced fifteen steel sculptures in collaboration with the Transfield Foundry in Sydney. Returning to the United States in 1970, he established a relationship with Nash Foundry in Pittsfield, Massachusetts and from that point on worked exclusively in milled steel. 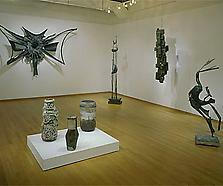 In 1975, he exhibited his largest pieces, a 1974 untitled sculpture ten feet high and thirteen feet in width and depth. 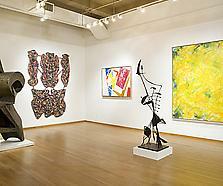 His final works demonstrate his consistent mining of the monumental, dynamic, multi-dimensional potential of sculpture. * ‑Richard Stankiewicz, quoted in Emmie Donadio, “Miracle in the Scrap Heap: The Sculpture of Richard Stankiewicz,” Miracle in the Scrap Heap: The Sculpture of Richard Stankiewicz, exh. cat., Addison Gallery of American Art, Philips Academy, Andover, Massachusetts, 15. † Fairfield Porter, ARTNews (December 1953), quoted in Miracle in the Scrap Heap: The Sculpture of Richard Stankiewicz, 150. 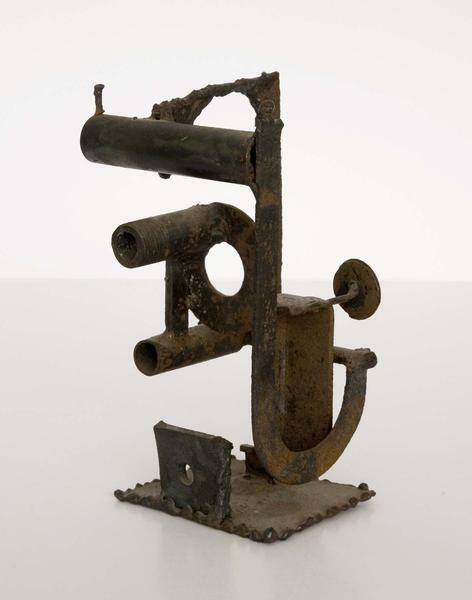 ‡ Miracle in the Scrap Heap: The Sculpture of Richard ­Stankiewicz, 12.